Who knows. It's a little difficult to find information for some of these signs, so I can only work with what I'm given. More so on some of the interim signs that were quickly replaced in the early '80s for the trunk color change. If someone comes across a roll sign with that particular exposure, please let me know. EDIT: Finally got to a new page. EDIT 2: I've shrunken the image sizes for the earlier posts. This way, nobody's scrolling down for days to get to the next post. Good morning and Merry Christmas. Here's another addition to the gallery. Upon delivery of the cars, starting in May 1988, all incoming R68As were equipped with these curtains, a change from the alphabetical order found on their Westinghouse cousins. Also, this one included options in anticipation of the Manhattan Bridge closure, something the original curtains on the R68s did not, leading to several instances where those cars would be signed up as when the south tracks were closed. This lack of correct exposures led to some of the original R68 curtains being replaced with this model in the early 1990s. However, most trains would retain their original curtains until 2001 when they would be replaced with new ones that had a correct circle route. So does that make 3 varieties of 68/A curtains? Akzidenz originals with off-center bullets, preserved mostly on 2600s; 1988 replacements; and 2001 replacements? Some of the 68As had the Akzidenz ones as well, so maybe that switched in the middle of the order. At least the early 5000s came in with the Akzidenz curtains and a handful retain them. A sneak peek of what's coming next! Happy New Year! Ooh, the original '68 slant curtains. Can't wait. When these signs were placed in use on the trains, the cars in question were scattered across the system to provide necessary service during the delivery process of the R68 series of cars and the GOH of various car classes at the time, including the R40 slants. With the exception of the A and C, it was not outside the realm of possibility to see the 42s in service on any of the routes shown above on a semi-regular basis, at least according to the car assignments at the time. 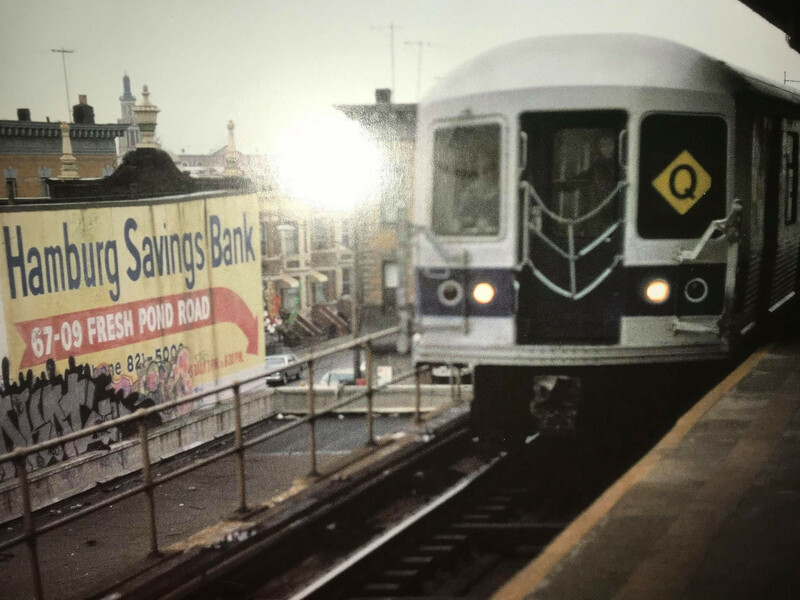 While the Manhattan Bridge south tracks closure was in effect at the time, that major service change seems to have had little impact on the sign order as the options are essentially from 1985, especially in regards to the Q, which was converted to a normal hours route in 1986, losing its rush hour diamond route designation. This is the last sign curtain produced for the R40-42 series of cars before their overhauls. Subsequent sign curtains produced would be horizontal in nature as the sign curtain mechanism was changed across all of the R40s-R46s during their respective overhauls. This curtain would also be the last in the R40-42 series to omit routes that were not travelled often on these particular cars, as the post-overhaul signs would include every possible route that existed at the time. Next time, we'll finally wrap up the R68s' original signs. Nice, there were used on R40/Ms as well I think, but wasn't there another version with a Neue Haas Grotesk , a Condensed (and possibly a with a Standard non condensed ) dating from 10/03/1986? Also, I made the black and white side signs for the R40M and R42, there was 2 versions: one modified version of the 1977 ones (both Northern and Eastern Divisions) with strip maps, and the other one had white bullets (like the front sign some R10 used in the late 80s), but I think I used the wrong fonts on this one, I'm waiting for someone to make the Standard Condensed and Neue Haas Grotesk Medium fonts to remake them and make R40 side signs. If you're planning to make them, then let me know. That looks as if it's a horizontal sign, judging by the inconsistencies of the edges. The replacement sign did feature a in Helvetica like that, but to my knowledge they were produced later. That also almost looks like an R68A replacement roll. If the date is correct, it would predate the overhauls of both the R40 straight ends and R42 cars by about two years, meaning they would not have had the horizontal rollsign mechanisms installed. I believe the offset could be a result of the angle the picture was taken and/or incorrect installation of the curtain on the apparatus. 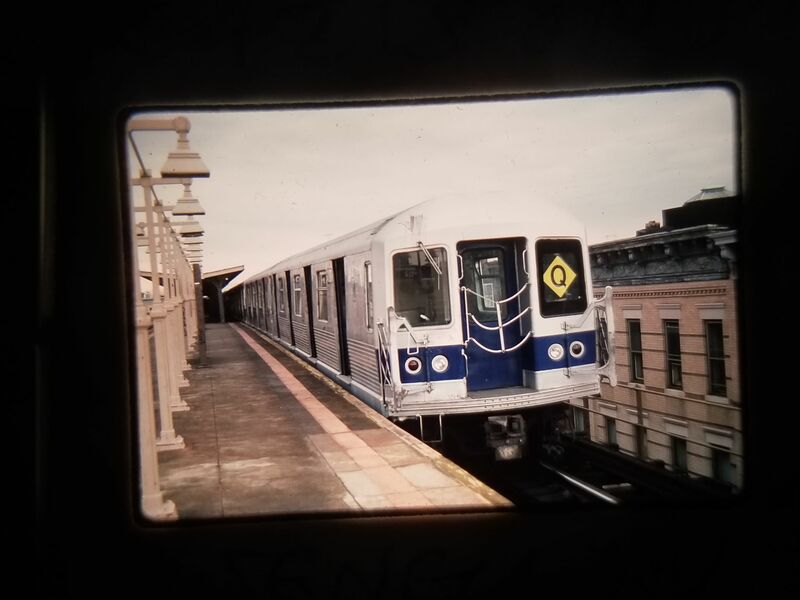 As for the signs themselves, in the mid-'80s, Transit created several interim sign curtains inhouse with the Bergen Street Sign Shop before outsourcing the job out to the usual slew of creators. One version contained a diamond Q with the Helvetica font while another would contain a diamond B and C with no option for the Q whatsoever. We'll take a look at these interim creations in their entirety at a later point. As with the destination signs created, this is the last curtain that would contain route options that the trains themselves could not easily access. The only exception to this would be the route curtains on the 44s and 46s, which also contain the Eastern Division routes. However, since these curtains were ordered and created in bulk for all of overhauled 40s - 46s, this can be excused. This would also be the last curtain to contain the diamond N route option as subsequent sign curtains would be created following the N / R terminal switch in May 1987, eliminating the rush-hour N short-turns at Whitehall St, which were labelled as such on maps and trains. Still never understood why the rollsign curtains had the Eastern Divison on them. Who knows? Maybe when they were ordered, they used the same specifications as they did for the replacement curtains for the R16-38 classes back in the early 80s. After all, the R68s were ordered in 1982. That means it was not outside the realm of possibility the replacement bulkhead signs for the older cars didn't occur around the same time as the order for new signs for the incoming R68 series. The only real difference between those signs and the ones for the new cars is the inclusion of the JFK Express route on the latter. So here I am, finally back with the original R-40 side roll sign. It could have been done in less than a week, but had many things to do. The exterior side and the "SPECIAL" readings are pictures from the Rollsign Encyclopedia book that a friend took for me, strip maps are done by me. Next roll signs I will post: 1985 and 1986 R-40/R-40M/R-42 side roll signs. @Ilia Just a heads up, your PDF link expired. Here we have the original sign curtains for the R46 series of cars. 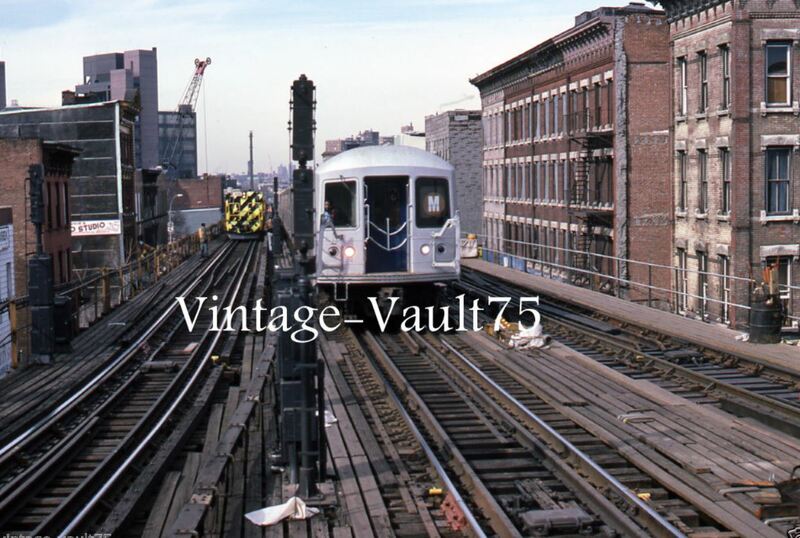 As these cars we intended to run on the lines serviced by the Jamaica Yard, the routes included on this curtain were only those that ran on Queens Blvd. This would be the only head-end curtain produced using the Chrystie St color scheme. Subsequent curtains would all be created after the Diamond Jubilee route color change. Next time, we'll take another look at some curtains from the R44s. Damnit, can you tell me how you upload PDF files without losing quality? 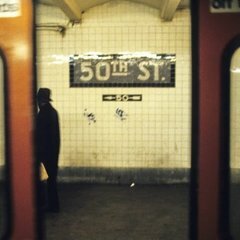 This thread is a fantastic window into the transit authority's difficult-to-shed past. Those rollsigns were something else. Imgur and Flickr both offer high quality uploads. To addon to the 70s curtains i have done the 1970s Vignelli Both the Destination and Route signs. (Luckily having them in my collection for a cheap price of 50 for both!! !From a very good friend. Here is the rare 1988-89 R38 South Destination sign alot of people boast and wonder about. Has some weird readings for 18th Ave on the IND Culver line. Bergen St. Avenue X. Jay St Boro Hall. Bedford Nostrand on the Crosstown line.... And so on.